More recently though, Microsoft has made giant leaps in their cross-platform compatibility strategy. 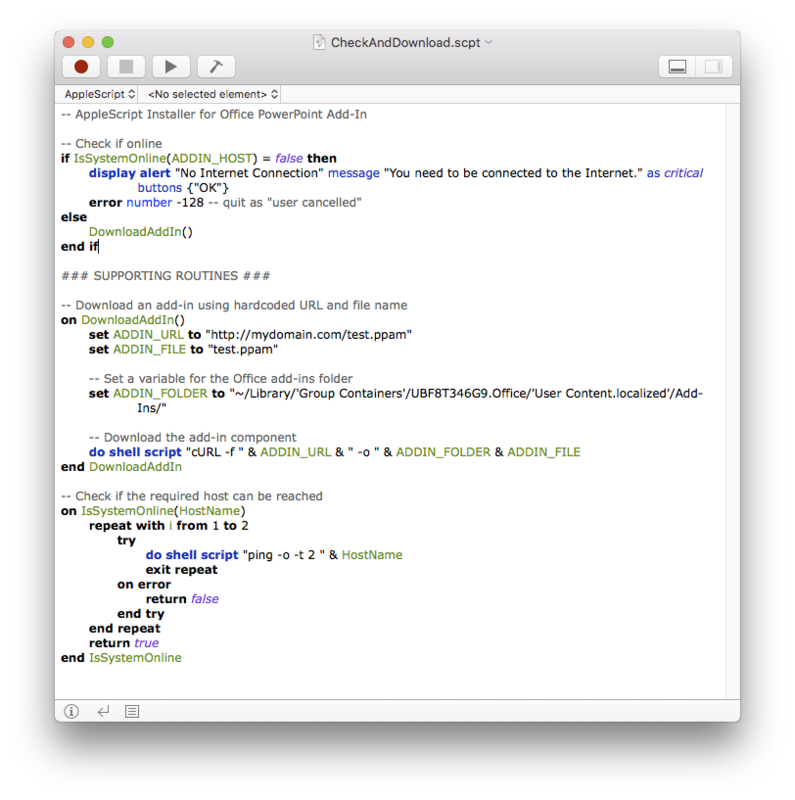 Office applications now run on Windows, OSX, Android, iOS and in a browser online. From various insights, we still see the majority of content being created on Windows and OSX even if the presentation of that content could take place on a mobile device. It’s this aspect of the designer’s world that led us to look at addressing the frequent request “can you provide your add-ins on the Mac?”. 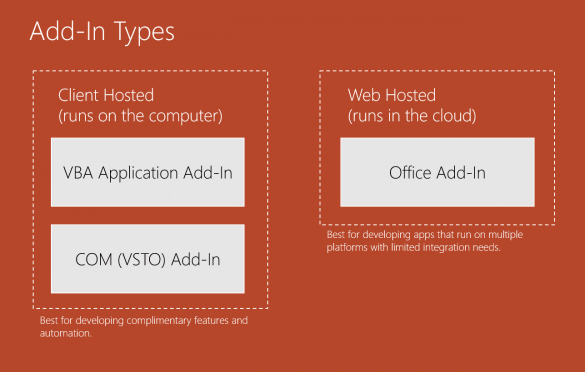 Need to know the difference between the 3 types of add-ins? Before we go any further, I should clarify what “add-ins” in this context mean, because it’s not at all clear. Many years ago, a programming model called VBA found its way into Excel. That then evolved and was adopted by all of the major Microsoft Office Suite of applications such as Excel, Word, Outlook, Access etc. These add-ins were simply known as “add-ins” or the longer term, “application add-ins” and gave third party publishers the ability to either extend the functionality of Office applications or automate them. Think of it as adding new features or making existing features do things over and over again, faster than a human can. VBA add-ins can be developed to run on a PC or a Mac but nothing else. Importantly, after 25 years since its introduction, VBA is still the only choice for developing tightly-integrated add-ins for both the PC and the Mac. And tightly integrated means adding ribbon tabs, modifying the built-in Office app ribbon, intercepting UI events, creating custom windows and other UI elements and integrating new functionality into context-sensitive menu (the menus that appear when you right-click on objects). Next came the COM add-in or VSTO add-in. This introduced a new programming language and lots of new possibilities such as the ability to add custom panes (like the Format and Selection panes built-in the Office apps). A key common factor of both VBA and COM add-ins is that they provide a high degree of integration with the Office application. So much so that it’s possible to develop add-ins that look and feel like they are part of the original product. COM add-ins only work on Windows PCs. The most recent phase of add-in development was the venture of Microsoft into cloud-based tech. The new Office Add-Ins model fits neatly with the desire to provide compatibility across a wide range of devices (PC/Mac), operating systems (Windows/OSX/Android/iOS) and platforms (desktop/mobile/online). These add-ins are hosted in the cloud which means you need an Internet connection to use them and because they’re designed using web-based technology, they can be designed to run on all the devices, operating systems, and platforms. Due to the variety of environments these add-ins have to work with, they are less tightly coupled with the Office application hosting them. 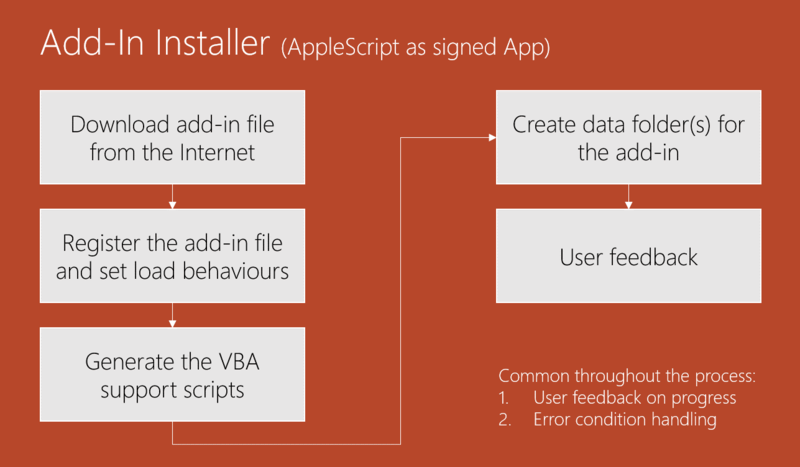 What this means in reality is that you can’t do as much with an Office Add-In as you can with a VBA or COM add-in. An installer on a Windows PC can take the form of an EXE, MSI or even Script-based solution such as VBS. The equivalent of EXE is DMG on a Mac but in the simplest case, an application add-in is a single file such as PPAM or XLAM so the overhead of such a model can be prohibitive. Office Mac lives in a sandbox. That is to say, it can’t [easily] communicate with the entire operating system and file system. 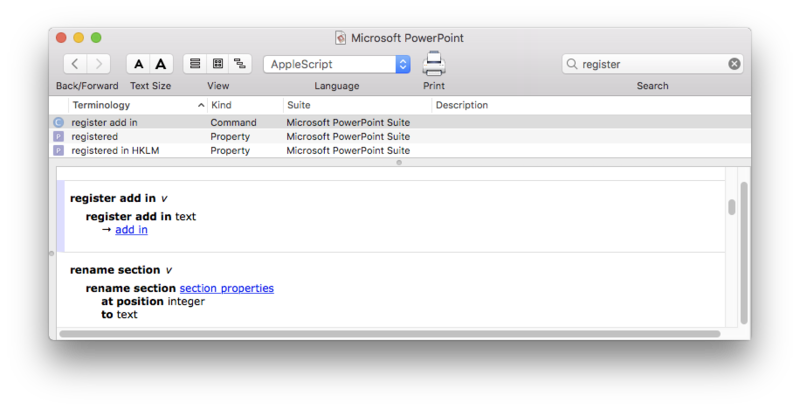 For example, a developer used to be able to execute AppleScript directly from VBA in Office:mac 2011. Now they need to consider expecting routines pre-written in a script files that has to be pre-installed, in a special folder on the OSX file system. That’s pretty restrictive. And we have a solution. Read on! Apple. Need I say more. There is a propensity to tie developers up in red tape, complexity and extortionate profit sharing models. We’ll discuss this more later. Although the concepts of this article can be applied to numerous Office applications, we’re going to focus on developing an add-in installer for a PowerPoint Add-In. Our installer needs to be simple for users. 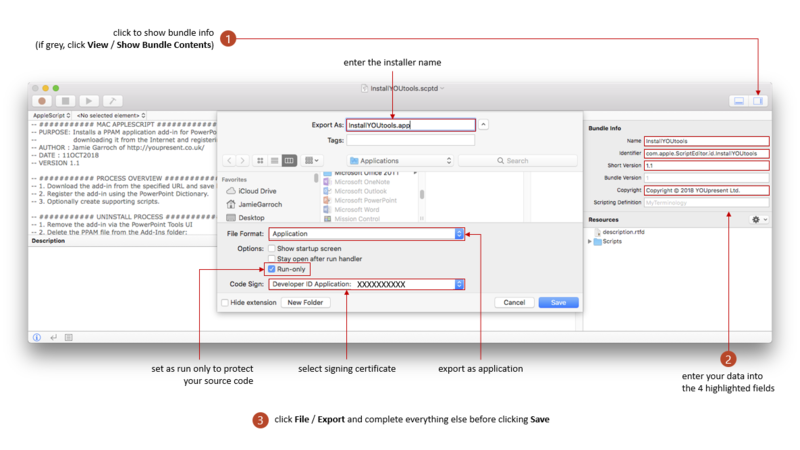 Before we embarked on this project, we had the 12 step manual process to the right for users install an add-in on Mac. It’s very complex and laborious. Some people will be familiar with loading an application manually via the PowerPoint / Tools / PowerPoint Add-Ins… UI. But on Office 2016 it’s made more complicated because of the sandboxing environment, enforced by Apple on Microsoft. Users have to find hidden folders with obscure names and use weird Apple keyboard shortcuts in the process. Instead of distributing all of the components of the add-in in a single package, we’re going to design a super lite add-in installer which downloads and creates the components during the installation process. 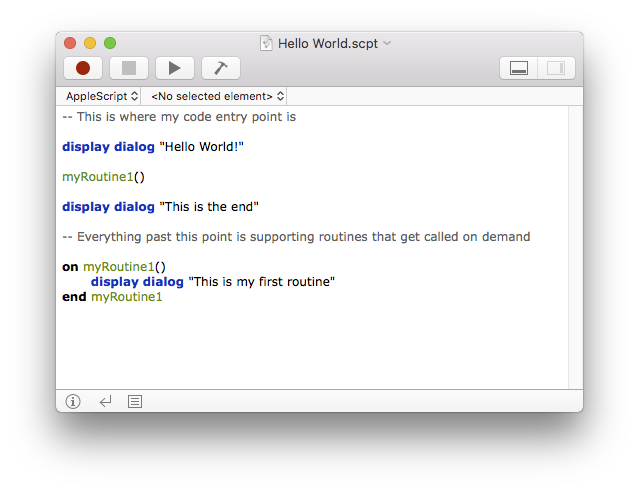 To make things as simple and maintainable as possible, we’re going to use the AppleScript framework within the Script Editor app on Mac OSX. Before we get started on the actual AppleScript code, let’s take a look at the basic structure. A single script file can just contain a series of statements which are executed in sequence from start to finish. There is no concept of modules but we can create sub routines and functions using the on..end structure. In this example, the code starts by showing the first dialog. It then calls the routine myRoutine1 which in turn displays the second dialog and then code execution returns above to finally display the end dialog. We’ll be using this structure to create our installer. set ADDIN_FOLDER to "~/Library/'Group Containers'/UBF8T346G9.Office/'User Content.localized'/Add-Ins/"
As a side note, an AppleScript Dictionary is a library of classes, commands, elements and properties which are accessible for scriptable apps. 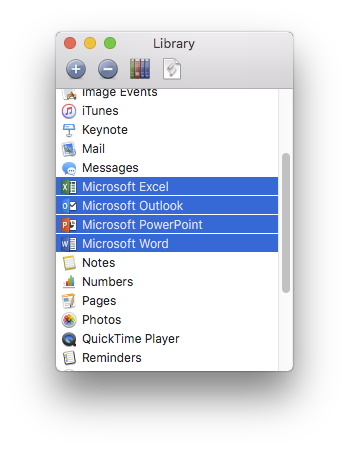 You can access them by clicking Window / Library in the Script Editor and then add new ones such as those for all the scriptable Office applications by clicking the (+) icon and navigating to the Applications folder on your Mac. This is our completed routine to register the add-in in PowerPoint. The reason the manual database method could still be useful is that we didn’t find the register add in command for the Excel Dictionary for example. The next part is to write the call to this routine in the main section of our script and with error handling in mind, we’re going to register the add-in and then read back some properties to make sure it was successful. set fldrOffice to GetHomeFolder() & "/Library/Group Containers/UBF8T346G9.Office"
set textFile to desktopDir & "myScript.scpt"
do shell script "rm -rf \"" & posixPath & "\""
set fromPath to POSIX path of desktopDir & "myScript.scpt"
set toPath to POSIX path of (path to library folder from user domain) & "Application Scripts/com.microsoft.Powerpoint"
property fldrScripts : "~/Library/'Application Scripts'/com.microsoft.Powerpoint"
if button returned of result = "No" then error number -128 -- quit as "user cancelled"
set progress description to "Installing add-in." set progress additional description to "Downloading..."
set progress additional description to "Registering..."
set progress additional description to "Validating..."
set progress additional description to "Creating VBA scripts..."
set progress description to ""
set progress additional description to ""
Once the script is complete, we need to create an app from it that users can download from the Internet in order to install the add-in. The behaviour and actions required by users to access the app for each of these three cases are described below. This is the worst case scenario for the user because OSX Gatekeeper will prevent the app from being run. Settings need to be changed in System Preferences / Security & Privacy to the Allow apps downloaded from option to be set to Anywhere as shown in the screenshot below. There will also be verbose security message presented to the user when they try to run the app. This is not a process a customer should have to go through and is really only suitable for developers. This makes this option highly unsuitable and it’s not recommended. The next best option if you already have a code signing certificate is to use it with the Script Editor to sign the exported app. 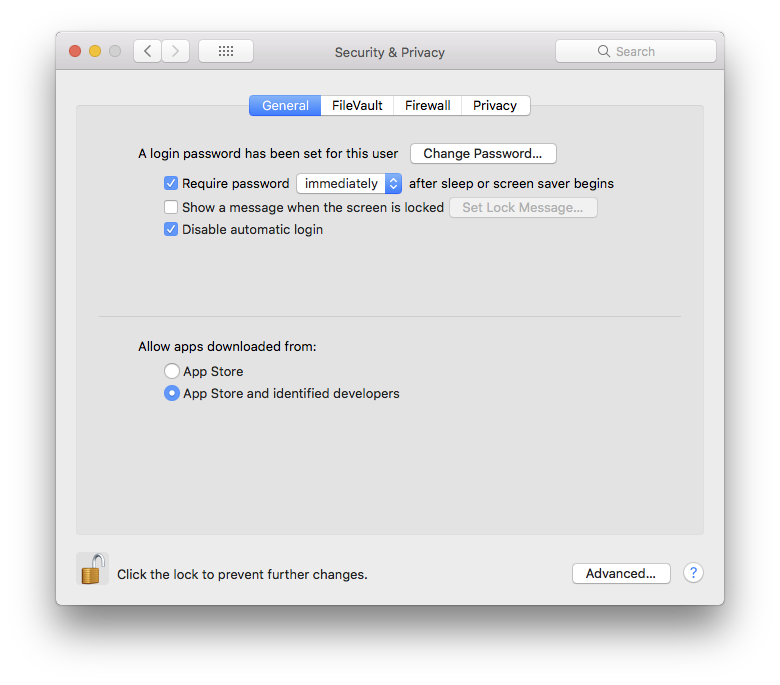 Note that this still requires the user to set the System Preferences Security option to the second choice as below but they do not need to make any terminal changes. The third option is the best option, with the exception of distributing the installer in the official Apple App Store. The System Preference change in option 2 still needs to be made but the advantage of this approach is that the user no longer needs to use the Ctrl key to open the app. But even with a purchased Apple certificate the user still gets asked to confirm the execution which could still pose a question of concern in their mind. Apple really want developers to submit their apps to the App Store and take a cut of the profit! To sign the app you first set up the version fields and then click File Export and set the output type as app and select the required pre-installed signature: (signatures are set up via Xcode or KeyChain Access). 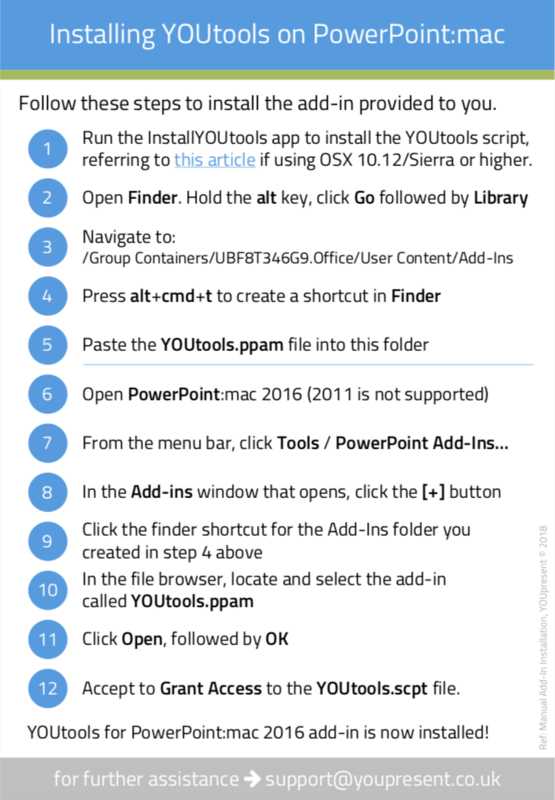 The first installer we built for Mac using this method was for our YOUtools add-in for PowerPoint. You can download the installer below.